For Tuesday March 12th: Read pages 108-157 in Bodega Dreams. Continue following the key themes and characters outlined. Highlight/underline passages of the book that you think show good examples of these themes or changes in key characters. How does Quiñonez present urban space and the urban experience? How do different characters view the neighborhood that they live in and does this change over time? For Thursday March 14th Read pages 157-213 (end of book) in Bodega Dreams. This is the weekly update for the NIGHT CLASS SECTION. If you’re in the daytime class, go to the update for your section or just keep scrolling down the page. Finish the first written assignment due Tuesday March 5 as hard copy (paper) ONLY. DO NOT ask to email me papers. See the Assignments page for it if you’ve misplaced your copy. (Re)Read the assignment sheet thoroughly and make sure you understand what I’m asking. There are no trick questions here: I’m looking for exactly what’s on there. Now is also the time to schedule time with Lehman’s ACE Center if you’re not totally confident about your writing ability. Also see the resources on the assignments page for some quick MLA formatting tips. Tuesday March 5: we’ll move to the first novel of the semester. 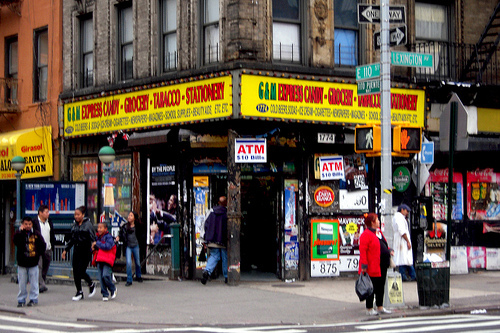 Read pages 1-54 in Ernesto Quiñonez’s Bodega Dreams. For Thursday, March 7, Read pages 55-107 in Ernesto Quiñonez’s Bodega Dreams. Continue following the major themes of the book and refer to the questions from last week for guidance. Also begin to look at how characters evolve and change over the course of the book. Finally, mark what you think might be key turns in the plot and significant developments. This is the weekly update for the DAY CLASS SECTION. If you’re in the night class, go to the update for your section or scrolling up the page. Week of October 16: (Night Class) Bodega Dreams conclusion, Midterm, and FILM VOTE!! Announcement: be sure to scroll to the bottom to vote and choose the film we’re going to watch. For Tuesday the 16th: Read pages 157-213 (end of book) in Bodega Dreams. The midterm will be on Thursday the 18th. The Midterm will be on Thursday the 18th in class. You’ll have (and want) the entire class period for it. We started review in the last class, and here are some things to consider. Exam format: 2 parts. Part 1 is short answer questions (3-4 sentences). 7 or 8 questions based on assigned readings. Part 2 will be an essay. You’ll have a choice of topics related to a major theme in “Puerto Rican Obituary,” Short Eyes, or Bodega Dreams. Review all the readings. Make sure you have them handy and re-download anything you can’t find. Know writers and the key plot points of the book and play we’ve read so far and be able to talk about the main characters in each. Review the poems and writers. You don’t need to know everything we’ve done, but you should know a few key poems from both Pietri and Pinero and basic biographical info about their lives. Think about key themes that we’ve been talking about so far this semester and how they occur in different works we’ve read. Think about how you would write an essay about one (or more) of them and examples of those themes in different things we’ve read/watched/listened to. If you haven’t read or watched anything, now’s the time to do it! You’re responsible for anything that’s been assigned or posted here as an assignment. Be on time and do not miss it! I will not be offering make-ups unless you’re hospitalized and have proof. So be there. Set your alarm clock and leave earlier than usual. The exam is hard, but not tricky. If you’ve been in class, paid attention, and done the work, you should be fine. The following week, we take a detour into representations of the city in film. Now for the fun part: I’m kicking the decision to you to vote for the one you want to see. What I’m looking for is something that shows NYC neighborhoods (or at least a neighborhood) with several outdoor shots, intersects with at least some of the themes we’ve seen, is in the time period we’re looking at but old enough to show a NYC that’s probably unfamiliar, and, honestly, I have or can get my hands on easily. It’s a quasi-scientific process with a heavy does of gut instinct. So here are the options: Spike Lee’s Do The Right Thing or Walter Hill’s The Warriors. Lee’s now-classic film deals with issues of race, space, police violence, and neighborhood life in 1980s Brooklyn. The Walter Hill-directed The Warriors (1979) is almost pure camp: a fictional look at the (very real) gang life in early 1970s New York. The acting is over-the-top, plot is fairly simple, but there’s a lot of action and it’s a definitive New York film in many ways. Here are trailers for both films, courtesy of YouTube. After that, make your choice with the poll below! One vote each (current students only, please). The poll will close next Thursday before class. Week of October 16: (Day Class) Bodega Dreams conclusion, Midterm, and FILM VOTE!! Review the poems and writers. You don’t need to know everything we’ve done, but you should know a few key poems from both Pietri and Piñero and basic biographical info about their lives. For Tuesday October 9, Read pages 55-107 in Ernesto Quiñonez’s Bodega Dreams. For Thursday, October 11, Read pages 108-157 in Bodega Dreams. Continue following the key themes and characters outlined. Highlight/underline passages of the book that you think show good examples of these themes or changes in key characters.